The Millennial generation has the world of technology being integrated into their upbringing, and this trend will only continue with generations to come due to the steady incline of technological advances. In this digital age, where information is commonly consumed in 30-second intervals, people are often functioning on autopilot. Improvements in industrial science have allowed humans to do more in less time, resulting in shorter attention spans, less thoughts to detail, and decreased immersions in daily life activities. Social media outlets, such as Facebook, Twitter, and blog sites, allow us to delve into the lives of others, and encourage life comparisons resulting in unnecessary anxieties regarding future plans. Relatedly, these technological timelines allow us to look back at our pasts, which can result in over-analysis of our previous actions and can cause an overwhelming amount of self-doubt. “Instead of worrying about the future or wallowing in the past, honing in on the present moment can lead to a life of greater productivity and psychological well-being,” said Rachel Enoch, a doctoral candidate in the Rehabilitation Institute from Manhattan, Kan. This idea of living in the present, as opposed to the past or future, serves as the goal of a Mindfulness Camp for Kids hosted by SIU. The camp, which is for kids aged 5-12, takes place every Saturday until May 9, 2015, and is designed to teach kids about mindfulness and why it is important. The camp aims to introduce kids to controlled breathing techniques, yoga, and explorations of the mind with the intent to boost school performance, relieve anxieties, and increase overall awareness. The camp is facilitated by the University’s office of Continuing Education and Outreach, whose mission is to provide alternative educational opportunities to people in the region. 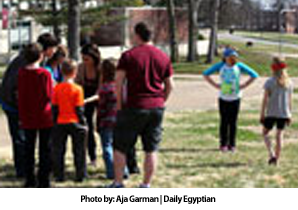 Camp activities include the instruction of listening and thinking techniques, yoga, and mindfulness walks in which children walk around campus and emulate an animal of their choice. The objective behind all of these interventions is to encourage kids to concentrate on what they are doing in the moment, rather than losing focus over the numerous distractions that life holds. Becoming more mindful is a skill, and it is not something that comes easy. It begins with attempting to be aware of oneself and the surrounding area. However, this can become even more of a challenge, specifically on college campuses, with our current reliance on technology. “It’s hard enough getting college students to really focus on stuff, because they’re used to these short, quick bursts that they find on the Internet,” says Kathy Smith, a coordinator of Continuing Education and Outreach. One of the keys to success in becoming a more mindful generation is to make small changes utilizing what is already comfortable. In the attempt to become more mindful, technology should not be eliminated, but rather partnered with mindfulness practices to create a better balance. Applications such as Sitting Still and the Mindfulness App coach users through breathing and meditation techniques. “If we can incorporate mindfulness with technology, we can have a nice marriage of the two,” says Enoch. By using technology to increase efforts to practice breathing, meditation, and awareness techniques, mindfulness will be more widely recognized and accepted by the college student body, and ultimately, by the entire SIU community.